Approximately 1 in 3 adults in the U.S. have high blood pressure, according to the Centers for Disease Control and Prevention. Hypertension can lead to heart disease, the leading cause of death in the U.S.. For this reason, it is important to make lifestyle changes to lower your blood pressure, including following a diet low in saturated fat, low in sodium and high in potassium, magnesium and fiber. 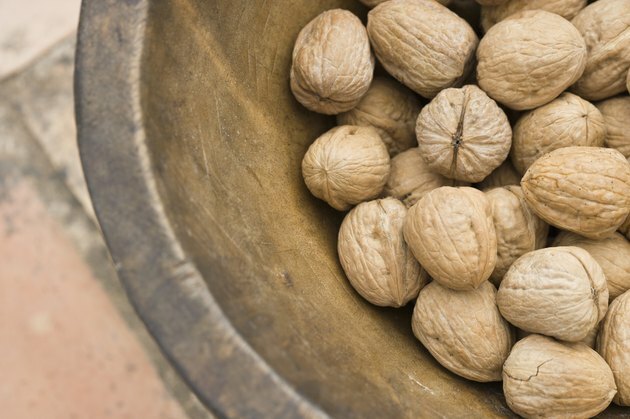 Nuts serve as a good source of potassium, magnesium, fiber and healthy fats, making them a part of a heart-healthy diet. The National Heart Lung and Blood Institute, in cooperation with the National Institutes of Health, developed the DASH diet -- Dietary Approaches to Stop Hypertension. This eating plan provides guidelines for long-term dietary changes to help lower your blood pressure. The DASH diet recommends limiting your sodium intake to less than 2,300 milligrams per day and encourages those with high blood pressure to reduce intake to less than 1,500 milligrams per day. The DASH diet encourages increasing your intake of minerals that help lower blood pressure, like potassium, magnesium and calcium. An important factor in lowering your blood pressure is following a low-fat diet, but not all fats are created equal. Saturated fat contributes to the buildup of plaque in the arteries that leads to high blood pressure. For this reason DASH recommends saturated fat account for no more than 6 percent of your total calories while total fat should account for no more than 27 percent of your calories. 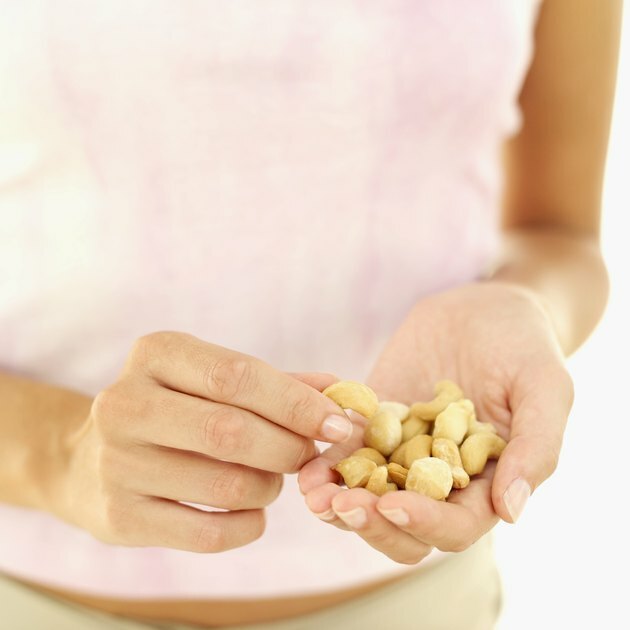 Although nuts serve as a good source of these heart-healthy nutrients, you should eat only handful a day to stay within your daily fat limits. The pistachio, which originated in the Middle East, has a distinctive green color and partially open shell. Although pistachios, like all nuts, contain fat, the majority of the fat is heart-healthy monounsaturated fat with only 1.5 grams of saturated fat in each 1 ounce. Pistachios are also naturally low in sodium, with 3 milligrams of sodium in a 1-ounce serving. This serving of pistachios provides 295 milligrams of potassium, 9 percent of the 4,700 milligrams recommended to promote healthy blood pressure. Pistachios also provide 3 grams of fiber and 34 milligrams of magnesium. Make sure you choose unsalted pistachios to keep your sodium in check. 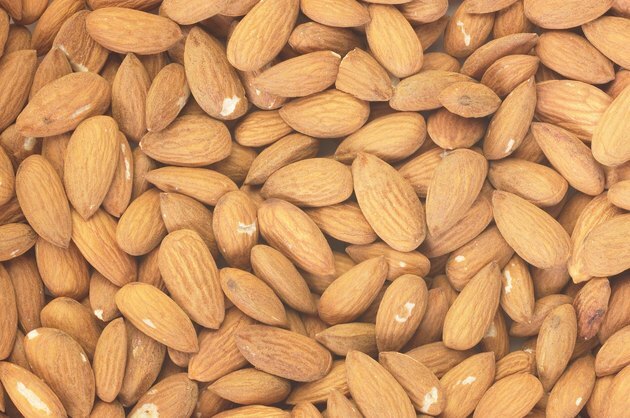 Originally cultivated in China and Central Asia, California now produces 80 percent of the world's supply of almonds. When trying to lower your blood pressure eat unsalted almonds that naturally contain no sodium. Almonds provide 20 percent of the recommended magnesium levels, with 76 milligrams in a 1-ounce serving. The same serving contains 200 milligrams of potassium and 4 grams of fiber. Almonds also qualify as a low saturated fat food, with only 1 gram of saturated fat per serving. Hazelnuts, also known as filberts or cobnuts, also originated in Asia but Turkey, Italy, Spain and the U.S. now produce the majority of hazelnuts in the world as reported by The International Tree Nut Council Nutrition Research & Education Foundation. Hazelnuts have a higher total fat content than the other nuts with 17 grams in 1 ounce, but only 1.5 grams is saturated fat. 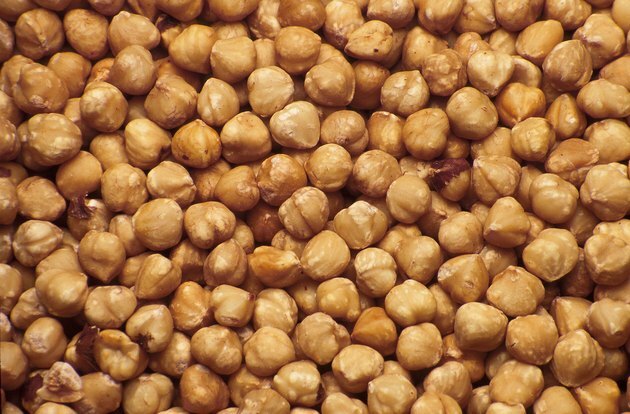 A 1-ounce serving of hazelnuts contains 46 milligrams of magnesium, 193 milligrams of potassium and 3 grams of fiber.